Announced just prior to San Diego Comic-Con, the Lynda Carter Wonder Woman will be teaming up with another iconic female superhero in Wonder Woman ’77 Meets The Bionic Woman. Following in the footsteps of Batman ’66 which has evolved into a series of crossovers including Green Hornet, The Man from U.N.C.L.E., and The Avengers, little is known about what the upcoming mini-series will entail. However, just as with Batman ’66, this opens up the door to many more possible crossovers. Probably the top such story on anyone’s list would be one with Batman ’66 as scribe Marc Andreyko has pushed toward this idea since beginning production of Wonder Woman ’77. Beyond this, though, is a multitude of viable options of series that emerged around the same time Wonder Woman was on the air. Lets then take a look at what series could be coming up in the future. 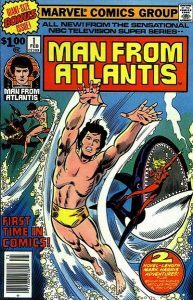 Featuring Patrick Duffy of Dallas fame, Man from Atlantis starred a being discovered near-death on the beach near the Naval Undersea Center. A humanoid appearing mostly human but seemingly able to live underwater (with gills and webbed hands), he was nursed back to health by Doctor Elizabeth Merrill. Amnesiac, the male was named Mark Harris by Dr. Merrill and, in appreciation for saving his life, came to work for the Navy. Harris’ first assignment would be to stop a man who would become his nemesis in Mr. Schubert (portrayed by Victor Buono of Batman fame), a mad scientist who wanted to wipe out the countries of the world with their own nuclear armament. Harris would manage to stop Schubert only for the madman to return again and again to endanger innocent lives. 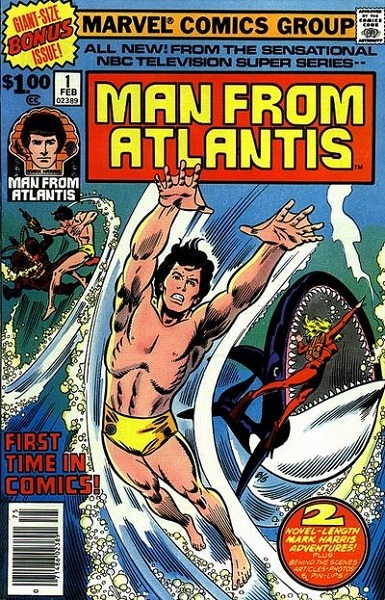 Man from Atlantis started out as a popular television film which spawned three more such movies until being picked up as a series. Sadly, as time passed, the show would become progressively more silly only lasting thirteen episodes. Consequently, the series would be the first American TV show aired in China where it remains popular even today. In recent years, Warner Archive would release the entire series on DVD as Patrick Duffy has penned a novel exploring the origins of his character that was released June 21, 2016 (the first in a planned series). It becomes fairly simply to see how such a series could relate to Wonder Woman as Mark Harris is an operative for the Navy and the superheroine’s civil identity similarly works for the US government as a member of the IADC. Further, the Wonder Woman series would incorporate a Superman-like character in Bryce Candall the Man of Steel so an Aquaman-like character in Mark Harris would not then be too far of a stretch to envision for a team-up. The story could also in a manner be a throwback to the Super Friends where Wonder Woman and Aquaman frequently paired up on assignment. Created by Glen A. Larson and lasting one season, Battlestar Galactica was a cultural phenomenon that unfortunately cost too much to produce. The series told the story of the Twelve Colonies Of Mankind whose homeworlds were destroyed by the Cylons, a race of malicious robots. The warship Galactica and 220 refugee ships are all that remains of the Colonies who venture into space searching for the lost thirteenth colony. Hounded by the Cylons at every turn, Galactica would finally discover Earth via gamma signals where it received transmission of the 1969 Apollo moon landing. Galactica starred Lorne Greene as Commander Adama (leader of the refugees), Dirk Benedict as Lt. Starbuck (ace fighter pilot), and Richard Hatch as Captain Apollo (Adama’s son and another ace pilot). 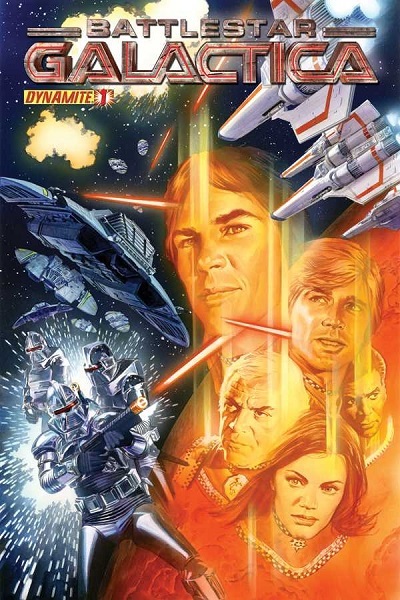 A sequel series emerged in 1980 set thirty years after the first series which proved quite unpopular that featured a new cast trying to update Earth’s technology so it could stand up to the Cylons. Considering the alien beings that came to Earth in Wonder Woman, a crossover could rather easily explain how a thirty year journey to Earth could have been cut down to ten thus mashing up elements of the Lynda Carter series and the Galactica’s mythology. Galactica continues today as a comic book series from Dynamite Entertainment currently in its third volume (the first issue of which arrives in stores August 2016 from Cullen Bunn and Alex Sanchez). When you talk about the seventies, you have to talk about the band Kiss. Formed in 1973, the quartet who wore make-up and comic book-inspired costumes taking the names Starchild, Demon, Spaceman, and Catman became superstars in 1975 with their live album Alive! as their song “Rock and Roll All Nite” became a hit. From there, Kiss exploded showing up in comics at Marvel, action figures from Mego, and a made-for-television film in Kiss Meets the Phantom of the Park (1978) portraying the band as superheroes. Arguably, Kiss was the biggest rock band on the planet by 1977 and everyone wanted a piece of them. For example, in 1980, the band would appear on The Lynda Carter Special where Carter sang their hit “I Was Made for Loving You” in a Kiss-inspired spider outfit (The Demon, aka Gene Simmons, would later wear that same outfit as Velvet Von Ragnar in the 1986 film Never Too Young to Die). Through the decades, Kiss would continue to have a connection to comics as publishers like Revolutionary, Image, Dark Horse, Platinum, Archie, and IDW would crank out titles for the band. 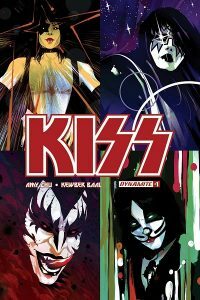 Just prior to San Diego Comic-Con, it was announced Dynamite would be putting out a Kiss comic series by Amy Chu and Kewber Baal. The band would also be animated several times including on The Simpsons and Family Guy as well as featured in the animated film Scooby-Doo! 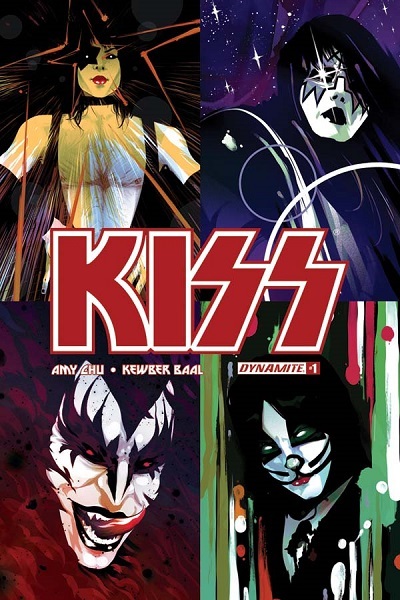 and Kiss: Rock and Roll Mystery (2015). There were plans to produce an animated crossover series in “Kiss Hello Kitty” for the Hub Network that appears to have been abandoned as the band is reportedly in the process of having a cartoon based on them made in the future. Given Kiss’ continued connection to comics, a crossover with Wonder Woman ’77 could very well become a reality. A great many things emerged from the 1970s that entered the pop culture lexicon for decades to come. One such advent was Dungeons & Dragons. Developed by Gary Gygax and Dave Arneson, it’s difficult to possible calculate the impact D&D had on the world from a creative standpoint to a game development standpoint to a literary standpoint. It was a creation that launched a thousand ships. Influenced by the works of J. R. R. Tolkien, Robert E. Howard, H. P. Lovecraft, and more, D&D spawned a multiverse of sword, sorcery, and horror that continues on today. 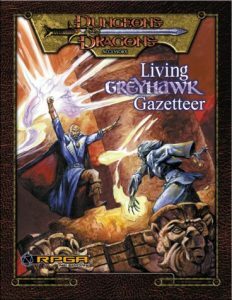 The first major world of D&D would come to be known as Greyhawk, the setting employed by Gygax and his family and friends who playtested the game in its earliest incarnation. The characters those players involved portrayed would become the cornerstones for this world, becoming non-playable characters (NPCs) when the game was sold to the public. Such NPCs included Lord Robilar the Fighter (Rob Kuntz), Tenser the Archmage (Ernie Gygax, who later also played Erac’s Cousin the Wizard), Ahlissa the Cleric (Elise Gygax), Terik the Fighter (Terry Kuntz), Melf the Archmage (Luke Gygax), and Murlynd the Wizard (Don Kaye). Gary Gygax himself would portray Mordenkainen the Wizard, Yrag the Fighter, Bigby the Wizard, Rigby the Cleric, Zigby the Dwarf, and the elves Felnorith, Vram, and Vin which he collectively referred to as the Circle of Eight. Of course, villains had to be assembled to trouble these heroes giving rise to Zagyg the Mad, Iggwilv the Archmage, Graz’zt the Demon Lord, Acererak the Demilich, Eclavdra the Drow Priestess, Demon Queen Zuggtmoy, Vecna the Arch-Lich, and Iuz the Evil. Coming from a world of gods and monsters, Wonder Woman is largely custom made to a crossover with the world of Greyhawk. The various worlds of Dungeons & Dragons are currently adapted for comics by IDW Publishing which is presently running its own crossover series seeing the worlds of Ravenloft battle Forgotten Realms by Jim Zub and Nelson Daniel. Due in part to the popularity of Mattel’s Barbie toyline, Hasbro would create G.I. Joe which featured dolls of men that dressed as members of the US military. While popular in the beginning, interest waned in the late-1960s in the wake of the Vietnam War. In a desire to step away from the military, the line was renamed the Adventure Team and featured adventurers of the jungle, mountains, deserts, oceans, and so on. 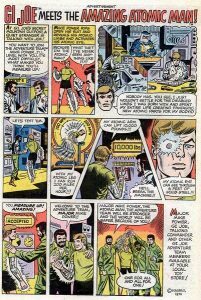 Due to the popularity of Kenner’s Six Million Dollar Man toys and Mego’s World’s Greatest Super Heroes!, a cyborg in Mike Power the Atomic Man and superhero Bullet Man were added to the offerings. To combat their heroes, the Intruders were introduced as alien forces trying to conquer Earth. Hasbro’s line evolved again in to the Super Joe Adventure Team led by Super Joe Commander with Super Joe and their alien comrades The Night Fighters Luminos and The Shield as they fought against the Terrons led by King Gor and his ally Darkon. Largely, this lead to the death of the line until the 1980s when Marvel teamed with Hasbro to make G.I. Joe: A Real American Hero. Very much a forgotten note in history especially given the prominence in which G.I. Joe: ARAH exists today, a version of G.I. 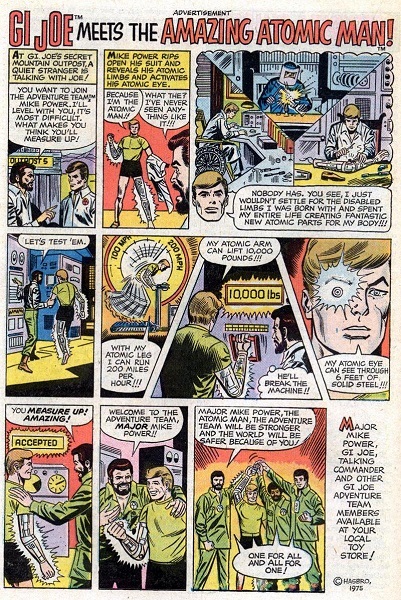 Joe featuring cyborgs, superheroes, and aliens would be perfect for a crossover with Wonder Woman ’77 given how much these things coincided with the television series. G.I. Joe is published today by IDW Publishing featuring the work of Larry Hama and S L Gallant. A parody of Batman and Robin from the minds of Sid and Marty Krofft, Electra Woman and Dyna Girl featured reporters Lori and Judy of Newsmaker Magazine who could Electra-Change into their costumed alter egos with their ElectraComs and combat villains like the Sorcerer, Pharaoh, Glitter Rock, Empress of Evil, Ali Baba, and Spider Lady. Only lasting eight episodes as part of The Krofft Supershow, the series became a cult favorite as bootlegs of the show were traded at comic conventions for decades. 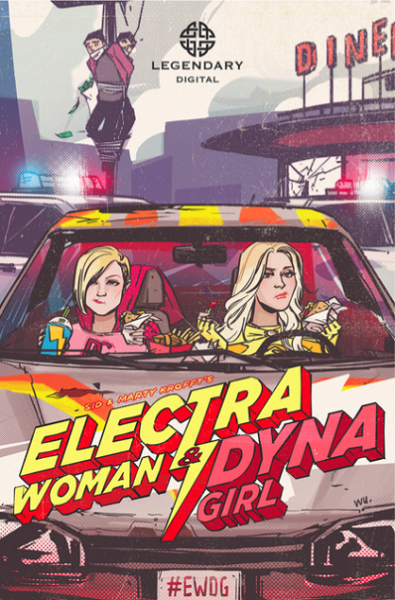 Earlier this year, a film reboot emerged from Legendary Entertainment for digital download featuring YouTube comediennes Grace Helbig and Hannah Hart in the title roles (as Sony distributed the film on DVD in early July 2016). While obvious how Wonder Woman could play into a crossover, what’s notable is that in the 1970s, few women were represented on television as superheroes. Largely, Wonder Woman, Bionic Woman, Isis, and Electra Woman and Dyna Girl were it. 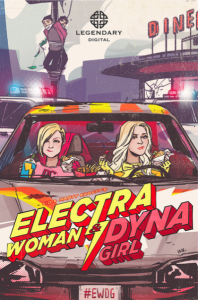 In very much the same way Wonder Woman ’77 Meets The Bionic Woman pays homage to these pioneers, so would a crossover with Electra Woman and Dyna Girl. In 1974, Filmation would produce a live action series based on Captain Marvel in the series Shazam! In the show’s second season, some changes were made including replacing actor Jackson Bostwick who portrayed Captain Marvel with John Davey as the show gained a companion series in Secrets of Isis as part of the programming block The Shazam!/Isis Hour. Predating Bionic Woman and Wonder Woman, Secrets of Isis featured actress Joanna Cameron as school teacher Andrea Thomas who discovered an ancient, mystical amulet which gave members of the Queen Hatshepsut bloodline the powers of the animals and the elements. As a descendant of Hatshepsut, Thomas could recite the incantation “Oh mighty Isis” and be transformed into a vessel for the goddess Isis’ power. The series proved to be popular and would accompany Shazam! for as long as Filmation had the property’s license (even crossing over with each other). When Hanna-Barbera briefly acquired the license to Captain Marvel, Isis would transition into the animated series Freedom Force. When Filmation reacquired Captain Marvel and produced the animated series The Kid Super Power Hour with Shazam!, Isis would guest appear in that’s show companion series Hero High (which also crossed over with Shazam!). In 2006, DC Comics would produce an Isis character based heavily on the Filmation one connected to the Marvel Family. Bluewater Comics would also produce a similar Isis character in 2002. Filmation’s properties would be acquired by DreamWorks and reportedly production company Grammnet of Paramount Studios acquired the license to make a film adaptation in 2004 (though, this has likely lapsed). 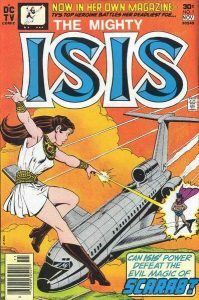 Noted earlier with Electra Woman and Dyna Girl, Isis is part of an exclusive club but where she is largely the founder. Further, Isis is very largely tied to the DC Universe without actually being a true member of it. Still, a Wonder Woman/Isis crossover is a long time coming. With Superman in theaters and Wonder Woman and the Hulk on television, producer Stephen J. Cannell (21 Jump Street, A-Team) wanted to lampoon the superhero phenomenon. 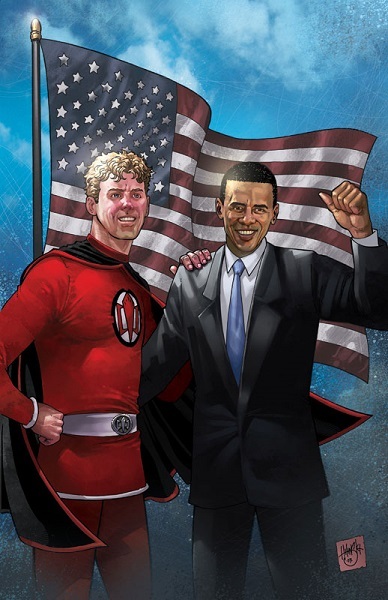 The result was The Greatest American Hero, where actor William Katt as school teacher Ralph Hinkley is given a suit of immense capabilities by aliens to combat crime and injustice on his world. Subsequently, Hinkley would lose the included instruction manual and not only be unaware of what the suit can do but how to activate its abilities. The bumbling would-be superhero partnered with FBI Special Agent Bill Maxwell (Robert Culp) and the show would last for three seasons. While initially a fairly down-to-earth series (as much as one with a superpowered suit could be), executives wanted the program to more closely align with other works in the superhero genre and Greatest adopted elements like ghosts, monsters, and voodoo. When the series ended, an attempt was made to produce a spin-off called “The Greatest American Heroine” featuring Hinkley seeking out a replacement in Holly Hathaway (Mary Ellen Stuart). While the pilot would not be picked up, it was edited to become a final episode for the series. In 2008, Catastrophic Comics released a comic book series based on Greatest and a television pilot rebooting the series from Phil Lord and Chris Miller (21 Jump Street, Son of Zorn) was ordered eight months ago by Fox. With the Wonder Woman television series, one of the ongoing themes was flipping the script of the “damsel-in-distress” trope often featuring the eponymous heroine rescuing men. Such a format would be gold for The Greatest American Hero which featured a hero who wanted to do good but was consistently ill-prepared for the job. Wonder Woman acting as a mentor to Hinkley could make for a compelling story. Arguably the greatest Doctor in Doctor Who history, actor Tom Baker would assume the role as the Fourth Doctor in 1974 (and remain until 1981). The regenerating Time Lord who traverses space and history in the T.A.R.D.I.S., the Doctor is an explorer, scientist, and hero (with a liking for jelly babies) facing the likes of the Master, Daleks, Cybermen, and the Black Guardian. The Doctor is joined on his journey by companions such as Sarah Jane Smith and K9 who assist and, at times, even save his life. 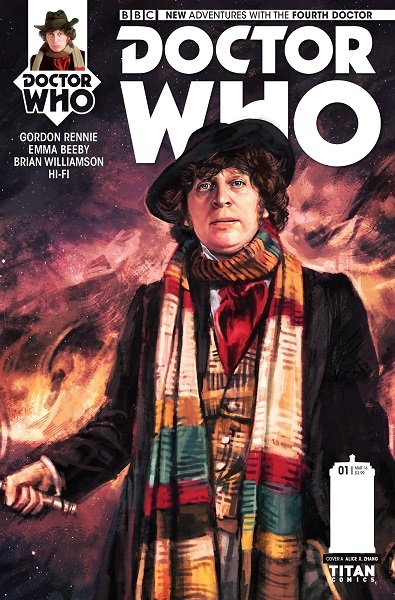 Baker’s Doctor Who was a turning point for the franchise making it an international phenomenon (and certainly a powerhouse in its native Britain) as it reached heights of popularity unparalleled both before and after his run where the actor’s portrayal is the most iconic incarnation of the series (his scarf in large part seen as being the quintessential representation of the Doctor). Known for being joined by powerful female companions who both enhance and engage the Doctor on his journeys, Wonder Woman is almost the physical embodiment of an ideal partner for the world-renowned time traveler. If the Doctor was the pop culture hero of the 1970s, Wonder Woman was that decade’s heroine. 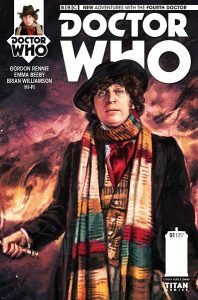 Doctor Who is currently published by Titan Comics with a Fourth Doctor mini-series by Emma Beeby, Gordon Rennie, and Brian Williamson. Noted earlier, while women were gaining more notable roles as leading characters in film and television, it still paled in comparison to that of their male counterparts. 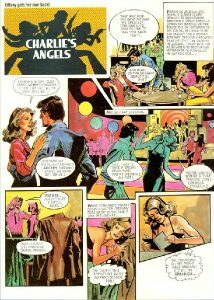 As Wonder Woman was the female superhero of the 1970s, Charlie’s Angels were the non-powered heroines of the decade. Airing for five seasons from 1976 to 1981 as a massive hit for ABC, Charlie’s Angels featured a team of female private investigators enlisted by the mysterious, reclusive Charlie Townsend for his Townsend Agency. His face never seen unobscured, Charlie communicates to his operatives through a speakerphone and leaves his associate John Bosley to act as his go-between for interacting with his employees. The series’ original trio, Sabrina Duncan (Kate Jackson), Jill Munroe (Farrah Fawcett), and Kelly Garrett (Jaclyn Smith), were undoubtedly the most recognized and remembered of the Angels who generally went undercover in order to solve any number of crimes the agency would be hired to crack. 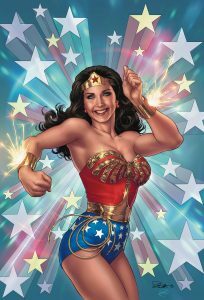 Wonder Woman, which featured Diana Prince as an intelligence agent for the IADC, often followed a similar formula but with the added element of transforming into Wonder Woman to face threats Prince could not tackle herself. In this manner, a story almost writes itself where the IADC investigates an incident that the Townsend Agency was already hired to solve. Such a series would be the merging of the biggest female stars of the 1970s in one place. Charlie’s Angels would become a film series beginning in 2000 and rebooted as a television series in 2011 by Alfred Gough and Miles Millar (Smallville, The Shannara Chronicles). Honorable mentions: Police Woman, Barbarella, CHiPs, Dukes of Hazzard, Mork & Mindy, Land of the Lost, Buck Rogers in the 25th Century, Exo-Man, and Starsky & Hutch.